Our story at the Bayfield Apple Company begins in 1982 as Einar Olsen assembled some orchards and began processing cider. He began making jam in 2000, and started distribution to local grocery stores. In the fall of 2009, he sold the operation to the Kositzke family. They realized the potential some fresh energy could bring to the table and got to work making the Bayfield Apple Company what it is today. The first decision was an easy one...they began to become certified organic. 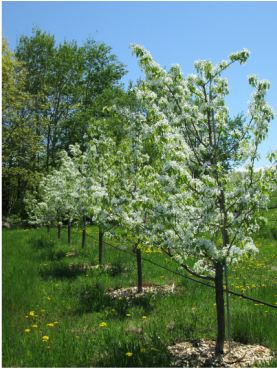 Although the Bayfield Apple Company already used integrated pest management to reduce the use of sprays, they believed that we could do better and go straight to organic production. The next straightforward idea was expanding production. The BAC team leased 15 acres from adjoining landowners that had neglected orchards and brought them back to production, as well as planted several hundred new trees on the "home farm." The idea is to make full utilization of the resources available, and seeing apples rot on neighbors trees, because no one cared for them, seemed like a waste. Our current fruit production includes: seventeen varieties of apples, pears, cherries, currants and blueberries.